HREMIC issuance for the first quarter of 2018 was $2.97 billion, the highest quarterly issuance total since the fourth quarter of 2015’s $3 billion. This volume trend is unlikely to continue based on the slowdown in HMBS. There were 5 transactions in the quarter underwritten by two sponsors, Nomura and Citigroup. For 2018Q1, Nomura issued $1.6 billion of securities and Citigroup issued $1.4 billion. Nomura has become the perennial lead issuer of HREMICs, though life-to-date Bank of America Merrill Lynch remains #1 with $19.6 billion of HREMICs for a 35% market share. Nomura has issued $16 billion for a 28% life-to-date market share. BAML did not issue any HREMIC securities in the first quarter. HREMIC issuance for 2017 was $9.24 billion, 6% behind 2016’s total of $9.86 billion, but still the third highest issuance year after 2016 and 2015. Fourth quarter volume was $1.93 billion, up 3% from 2017’s third quarter issuance of $1.87 billion. There were 25 transactions underwritten by three sponsors, Nomura, Citigroup, and Bank of America Merrill Lynch. Nomura remains the #1 issuer for the full year with $4.2 billion. Citigroup was second with $3.2 billion, and Bank America Merrill Lynch was third with $1.8 billion. Life-to-date BAML has issued $19.6 billion of all HREMICs for a 36.7% market share, and Nomura has issued $14.4 billion for a 26.9% market share. HREMIC volume in the second half of 2017 was off 30% from the first two quarters, suggesting investors are more comfortable owning HMBS outright than as structured securities. An increase in HECM prepayments disproportionately affects Interest-Only securities, which may help explain the volume drop. HREMIC issuance for the first nine months of 2017 was $7.31 billion, about 5% behind 2016’s first nine months’ issuance total of $7.68 billion. Third quarter volume was $1.87 billion, off 26% from 2017’s second quarter issuance of $2.53 billion. There were 19 transactions underwritten by three sponsors, Nomura, Citigroup, and Bank of America Merrill Lynch. Nomura remains the #1 issuer with $3.6 billion. Citigroup leapfrogged ahead to second with $2.0 billion, and Bank America Merrill Lynch was third with $1.6 billion. Life-to-date BAML has issued $19.4 billion of all HREMICs for a 37.6% market share, and Nomura has issued $13.8 billion for a 26.8% market share. 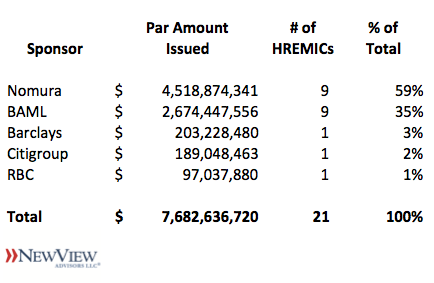 For the nine months ended September 30, 2017, more HREMICs ($7.31 billion) than HMBS ($7.29 billion) were issued, suggesting the vast majority of HMBS now find their way into HREMIC securitization. The stronger and broader bid for the Interest-Only HREMIC class that emerged in 2016 has made the HREMIC structure the most profitable option for broker dealers. HREMIC issuance for the first half of 2017 was $5.44 billion, eclipsing 2016’s first half issuance total of $5.43 billion, and on pace to set a fourth consecutive annual record. Second quarter volume was $2.53 billion, off 13% from the near record quarterly issuance of $2.91 billion set in 2017Q1. There were 14 transactions underwritten by three sponsors, Nomura, Bank of America Merrill Lynch, and Citigroup. Nomura remains the #1 issuer, with $3.2 billion, Bank of America Merrill Lynch was second with $1.4 billion, and Citigroup was third with $853 million. Life-to-date BAML has issued $19.2 billion of all HREMICs for a 39% market share, and Nomura has issued $13.3 billion for a 27% market share. Approximately 90% of outstanding HMBS securities have been resecuritized into HREMICs, up from 85% at the end of 2017Q1. At this point, substantially all HMBS are finding their way into HREMIC securitization. A stronger and broader bid for the Interest-Only HREMIC classes emerged last year, and as a result the HREMIC structure, which allows issuers to create bond classes such as these “IO” securities, has become the most profitable option. HREMIC issuance for 2017Q1 was $2.91 billion, surpassing 2016’s first quarter issuance total of $2.84 billion, and on pace to set a third consecutive annual record. First quarter volume was just $89 million shy of the record quarterly issuance of $3.0 billion set in 2015Q4. There were 8 transactions underwritten by three sponsors, Nomura, Bank of America Merrill Lynch, and Citigroup. Nomura remains the #1 issuer, with $1.7 billion, Bank of America Merrill Lynch was second with $756 million, and Citigroup was third with $453 million. Life-to-date BAML has issued $18.5 billion of all HREMICs for a 39% market share, and Nomura has issued $11.9 billion for a 25% market share. Approximately 85% of outstanding HMBS securities have been resecuritized into HREMICs, up from 80% at the end of 2016. A stronger and broader bid for the Interest-Only HREMIC classes emerged, and the seasoned HMBS pools we’ve referenced in past blogs are also contributing to increased HREMIC volume. The HREMIC structure, which allows issuers to create bond classes such as these “IO” securities, is increasingly the most profitable option. 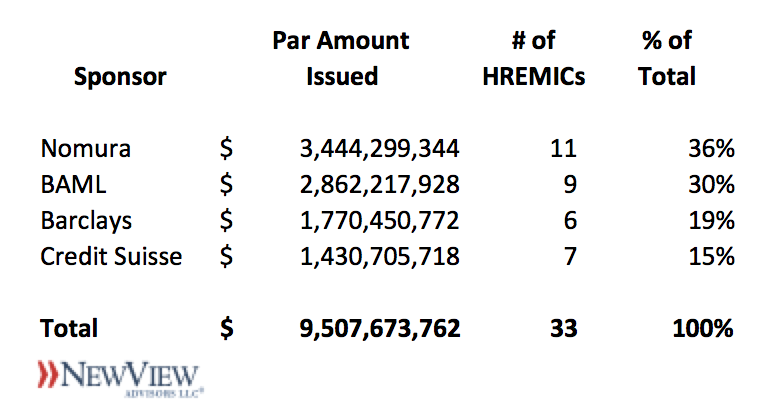 HREMIC issuance for 2016 was $9.86 billion, surpassing 2015’s $9.51 billion, a previous record. There were 27 transactions underwritten by five sponsors, Nomura, Bank of America Merrill Lynch, Citicorp, Barclays, and RBC. Nomura remains the #1 issuer, with $5.4 billion, 54% of their life-to-date issuance of $10.1 billion. Bank of America Merrill Lynch was second with $3.2 billion. Life-to-date BAML has issued $17.8 billion of all HREMICs, for a 40% market share. Nomura has issued 23% of all HREMICs, and Barclays 13%. Approximately 80% of outstanding HMBS securities have been resecuritized into HREMICs, up from 77% at the end of 2016Q3. 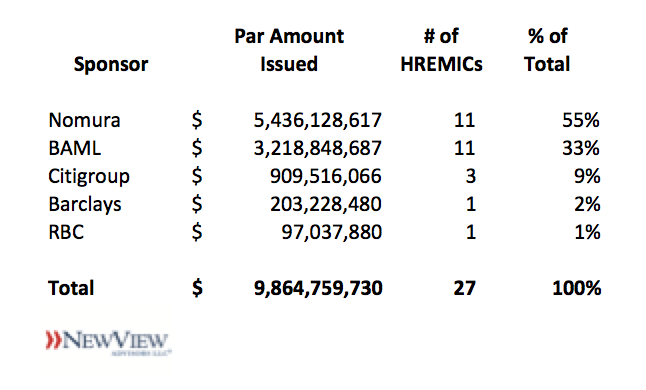 A stronger bid for the Interest-Only HREMIC classes emerged in 2015, and the seasoned HMBS pools we’ve referenced in past blogs are also contributing to the HREMIC volume uptick. The HREMIC structure, which allows issuers to create bond classes such as these “IO” securities, is increasingly the most profitable option. 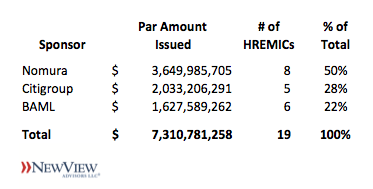 HREMIC issuance for the first 9 months of 2016 was nearly $7.7 billion, surpassing the first 9 months of 2015’s $6.5 billion, a previous record. The industry remains on pace to set its second consecutive annual issuance record. There have been 21 transactions underwritten by five sponsors, Nomura, Bank of America Merrill Lynch, Barclays, RBC, and Citicorp. Nomura remains the #1 issuer, with $4.5 billion, almost half their life-to-date issuance of $9.2 billion. Bank of America Merrill Lynch was second with $2.7 billion. Life-to-date BAML has issued $17.2 billion of HREMICs, for a 41% market share. Nomura has issued 22% of all HREMICs, and Barclays 14%. This is the first HREMIC transaction for Citicorp, bringing the number of current HREMIC issuers back to five for the first time since 2014. Approximately 77% of outstanding HMBS securities have been resecuritized into HREMICs, up from 73% at the end of 2016Q2. A stronger bid for the Interest-Only HREMIC classes emerged last year, and the seasoned HMBS pools we’ve referenced in past blogs are also contributing to the HREMIC volume uptick. The HREMIC structure, which allows issuers to create bond classes such as these “IO” securities, is increasingly the most profitable option. 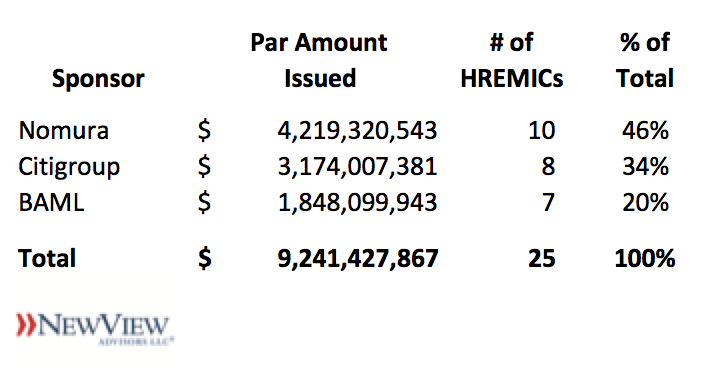 HREMIC issuance for the first 6 months of 2016 was $5.4 billion, surpassing the first 6 months of 2015’s $4.3 billion, a previous high water mark. The industry is on pace to set its second consecutive annual issuance record. There were 14 transactions underwritten by four sponsors, Nomura, Bank of America Merrill Lynch, Barclays, and Royal Bank of Canada. Nomura remains the #1 issuer, with $3.3 billion, nearly equaling their 2015 full year total of $3.4 billion. Bank of America Merrill Lynch was second with $1.8 billion. Life-to-date BAML has issued 41% of all HREMICs, Nomura 20%, and Barclays 15%. This is the first HREMIC transaction for RBC. Approximately 73% of outstanding HMBS securities have been resecuritized into HREMICs, up from 64% at the end of 2015. A stronger bid for the Interest-Only HREMIC classes emerged last year, and the seasoned HMBS pools we’ve referenced in past blogs are also contributing to the HREMIC volume uptick. The HREMIC structure, which allows issuers to create bond classes such as these “IO” securities, is increasingly the most profitable option. 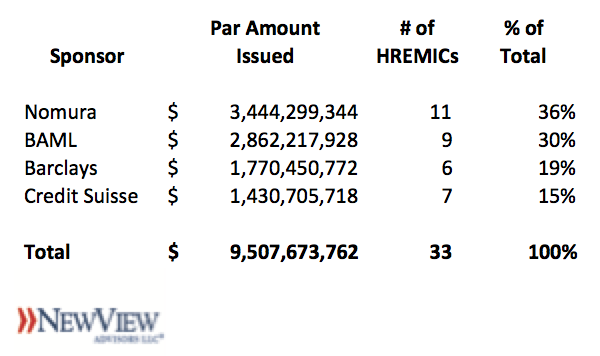 HREMIC issuance for all of 2015 was just over $9.5 billion, easily surpassing 2014’s $5 billion of issuance and the previous full year record of $6 billion set in 2012. There were 33 transactions underwritten by four sponsors, Nomura, Bank of America Merrill Lynch, Barclays, and Credit Suisse. Nomura remains the #1 issuer for the year, with $3.4 billion, Bank of America Merrill Lynch was second with $2.9 billion, and Barclays pushed ahead to third with 6 issuances totaling $1.8 billion. Credit Suisse rounded out the group with $1.4 billion issued for a 9% market share. Life-to-date BAML has issued 42% of all HREMICs, Barclays 17%, and Nomura 14%. Approximately 64% of outstanding HMBS securities have been resecuritized into HREMICs, up from 60% at the end of the third quarter. A stronger bid for the Interest-Only HREMIC classes emerged this year. The HREMIC structure, which allows issuers to create bond classes such as these “IO” securities, is increasingly the most profitable option.